San Tan Valley has made a rapid transformation from desert landscape and farmland to a fast growing commuter town on the base of the San Tan Mountains. Today it is home to over 80,000 residents, mostly families that enjoy the beautiful environment and the laid back lifestyle. But wherever homes are built on formerly unoccupied land, you will also be dealing with critters and pests that have lived there before. It is no surprise that many San Tan Valley home and business owners encounter some type of pests at one time or another. In order to take care of the problem effectively, you need to work with a San Tan pest control expert that has experience and stellar ratings. 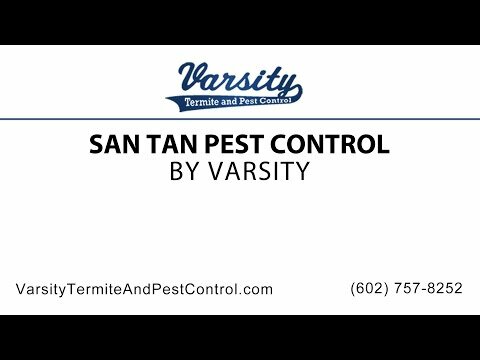 We are Varsitiy termite and pest control and we are proud to be serving our customers in the San Tan area. We know that pests can create all sorts of problems on your property and it can be a giant headache. More than just annoying, pests can pose serious threats to your health, home and/or business. Throughout Arizona, Varsity keeps residential and commercial properties pest free. From top to bottom, exterior to interior, we have you covered. You can count on our years of experience to get the job done right the first time, every time. So don’t hesitate, get your San Tan Pest Control started and call 602-757-8252 or visit us online at varsitytermiteandpestcontrol.com today. Varsity Termite and Pest Control has decades of experience in providing top notch pest control services to homes and business in San Tan Valley and to surrounding communities. We know that pests can be an expensive nuisance. Termite damage, for example, can be quite costly if not detected and taken care of early. The moment you discover pest activity, contact our team of exterminators to help you to get rid of the unwelcome house guests as fast and efficiently as possible. Our San Tan Valley pest control company is family owned and operated. We are your local pest control professionals that offers not only top customer service, but superb pest control and elimination as well. Being a local company also means that we are extremely familiar with any and all pests you may encounter in your home. Our well-trained pest professionals will do everything to keep you family healthy and your living space free of pests. Our customers love our professional expertise and appreciate our fantastic customer service, which is why we often get referrals and great reviews on sites such as Yelp, Google+, BBB and Home Advisor. We are so proud of our reviews, because they show that we do our job well. Pests come in many shapes and sizes. No matter if you are dealing with roof rats, a pigeon problem, an ant invasion, spiders, mice or any type of pest, we can help you to pinpoint the source and eradicate the threat. Our San Tan Valley pest control experts are licensed by the State of Arizona and have received extensive training enabling them to provide the services we offer. Varsity strives to make your home or business a safer place through a methodical and proven approach to pest control and by employing the latest technology available. Up to date methods and a keen understanding of the pests we are dealing with makes the Varsity exterminators so successful at what they do. Try us today! Termites can be hard to detect. But Varsity’s trained professionals can perform a San Tan Valley termite inspection and discover the presence of termites long before they are visible to the homeowners. Our free termite inspections are a great way to ensure that your home is not jeopardized by these destructive little creatures. Scorpions are another big nuisance for San Tan residents. They are great at hiding as well, can cause serious health issues if they end up stinging a human and usually do not respond to traditional methods of pest control. To ensure that scorpions stay clear of and out of your home, we offer San Tan scorpion sealing and control services. Ask your San Tan Valley pest control tech for more information. Many homeowners or business managers attempt to get rid of pests on their own in the hope that it will be cheaper. What starts out as an attempt to save money often ends up costing much more than it would have, had they called a professional San Tan Valley exterminator right away. Treating pests with the wrong pesticide or method will not only not kill them, but can them more aggressive, cause them to spread out or move to areas that are harder to access. That is usually the point, when Varsity is called in to help. While we still can get rid of the problem, it would have been much easier and also cheaper, if they would have contacted our team right away. Some things are great DIY projects, but pest control is not one of them. Aside from specializing in scorpion sealing and termite removal, we also have extensive experience in getting rid of cockroaches. Cockroaches are resilient little beasts which is why they have been around for 320 million years. This shows just how hard they are to kill off. Our experienced roach techs can help you to eliminated roaches from your home and give your great tips on how to prevent them from coming back. For all your pest control needs in San Tan Valley and surrounding areas, you have an experienced and trustworthy partner in Varsity Termite and Pest Control.